I used to love running my fingers across my crinkled roots whenever a touch-up was overdue. As fascinated as I was with the texture of my natural hair, however, I was too scared to cut the relaxed hair off. 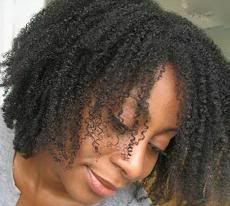 My natural hair was cottony and dull, like wool, with no curl definition. And even though it was coarse, it was never very dense or long, so my styling options were limited. I’d also had “problem” hair growing up, so my mother had to cut my hair very low at least twice. While everyone else enjoyed a Jheri Curl, or straight hair, I was the girl with glasses, braces, and a short mis-shapen afro. Talk about trauma! 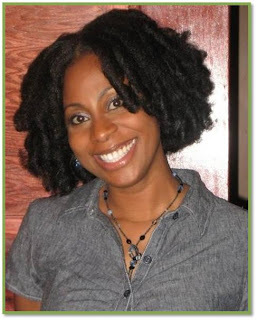 So even into adulthood, I shied away from the thought of wearing my hair in a natural style. I was afraid it wouldn’t look “pretty” enough. Five years ago, when my hair became damaged from over-processing, I finally decided to give it a “rest”. 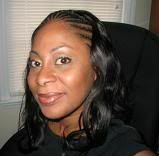 I also became pregnant around that time, so I chose to wear extensions and weaves for about 6 months. One month later, I finally got the courage to do the big chop. I was on medical leave so I figured “If I don’t like it, I can change it. No one will ever have to know!” And there began my natural hair journey. I started out wearing cornrows going straight back into a 1/2 wig. After several months, my natural hair was long enough to stay in a ponytail holder. At first, warm water and loads of Miss Jessie’s Curly Meringue was all I needed to get my hair to stay put. But as my hair continued to grow, getting it to “cooperate” became more and more difficult. I feared that wearing it back all the time might put too much tension on my hairline. But whenever I tried to wear it out, it would shrivel up at the first sign of humidity. CURSES! My first glimmer of hope came when I ran into an old friend at a wedding, 2 years later. She was wearing her natural hair in beautiful twists, and I was impressed at how neatly they lay. 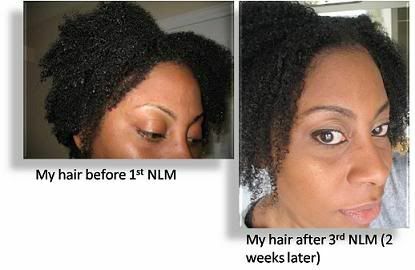 She told me that she had been using a natural relaxer to help loosen her coils. Intrigued that such a thing existed, I searched the web as soon as I got home. In my search, I came across Baka Beauty’s Natural-Laxer Mix. I read the ingredients: Sahara Clay, myrtle, rose petals, clove, nettle, sage and lavender. I read it again, just to make sure that I wasn’t missing anything. I was skeptical about how well it might work, especially because there were no pictures to testify to its effectiveness. Desperate for something, however, I decided that it couldn’t hurt to try it. Over the recommended 3 applications, 1 week apart each, I noticed that my curly knots began to unravel, and gradually became softer and looser. By the time I washed out the 3rd application, I could actually see defined ringlets in some parts of my hair. The definition was most easily seen when my hair was wet, or if I put a conditioning gel in it. I was very pleased with the results, needless to say. The Natural-Laxer Mix didn’t make my hair straight or wavy— it just enhanced the definition of my natural curl pattern, stretched it out a little, and made it softer. Each of these pictures were taken only 1 week apart. My hair appears longer in each picture, due to the “stretched out” effect of the Natural-Laxer Mix. Because each person’s hair is different (even though it may look the same to naked eye), your hair may not respond to this product the same way that mine did. 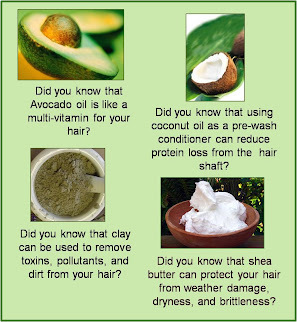 Your coils may loosen more than mine did (my Godsister experienced this after only 2 applications), or your hair may just soften a little bit. But as someone whose curly knots could at one point rival those of her ancestors, I recommend you give it a try. As long as you have realistic expectations, you may be surprised at what a little clay with herbs can do! Notice how you can actually see the curl pattern in my hair in the 2nd photo, without the magnifying glass that you'd have to use for the 1st photo. Here's how it looked when I used a diffuser to stretch it out some. In the spirit of experimentation, I tried using a chemical texturizer 18 months after starting the Natural-Laxer Mix. I know, I know. Too late to slap me. I've already slapped myself. I wanted my curls to be a little looser (especially in the back), and I wanted to see more of my hair length. I got what I asked for, initially, I suppose. 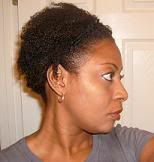 But my natural curls weren't as defined, and when I slicked it back, the deep waves I once enjoyed were no longer there. Also, when I did my texturizer touch-up, I accidentally overlapped a teeny portion of it with the previously texturized hair. Well, you know that's a NO-NO! My hair was somewhat straight where the 2 treated parts met, and within 2 months, my hair was far thinner, and shedding like crazy. Curses! So was it worth it? Not to me. So, after 5 months of growing my hair out, I've slashed and burned the dead hay on my head, slapped that NLM mixture in it, and it's back to the drawing board! In the pic at the top, did you use flexi rods to curl your hair? Did you set on wet hair or blow dried hair? I love how it came out. I love the low cut. I am so excited for your beautiful budding curls! They look so healthy and you are radiant.